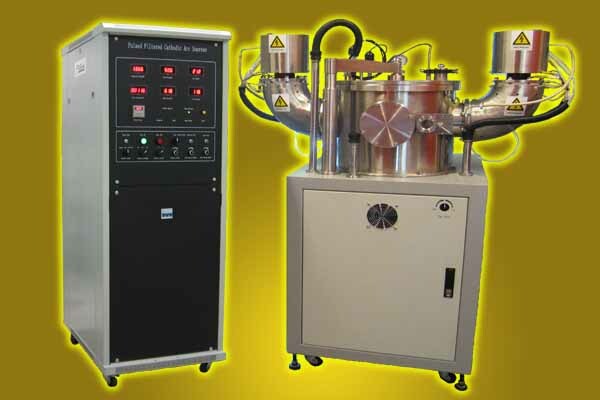 Cathodic vacuum arc source is an intense source of highly ionized plasma, where the arc current can be up to above 300A, ideal for depositing and implanting different elements into a surface. 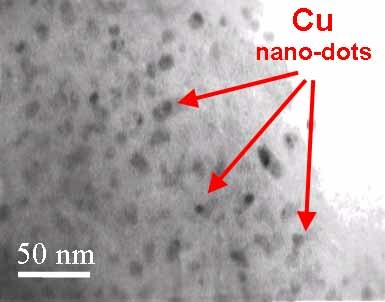 With incorporation of macroparticle 90o curved filter, the almost fully ionized plasma guided by electromagnetic fields, it is currently used for reactive deposition of defect and pinhole free, dense, protective, or decorative coatings as well as nano-structured, nano-composited and multilayer thin films , such as TiN and TiAlN, Zr3N4, TiCN., ZnO, HfO and so on. 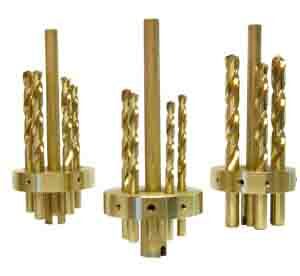 Industrial drills coated with TiN have high surface hardness and long service lifetime. 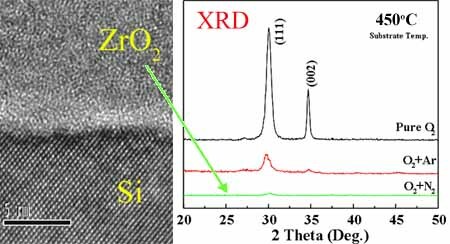 Nitrided ZrO2, which has high crystilline temperature and good interface, is used as high-k dielectric gate oxide for C-MOS. PVC with embedded Cu nano-dots has high degree of antibacterial property and long service lifetime. Discharge Pulse Duration: 0.2 - 5 ms. Continuously adjustable. Pulse Frequency: 0-50 Hz. Continuously adjustable. Cabinet dimension: 1600 mm x 600 mm x 800 mm. T. Zhang, Y. C. Zhang, P. K. Chu, and <?xml:namespace prefix = "u2" /><?xml:namespace prefix = "u4" />I. 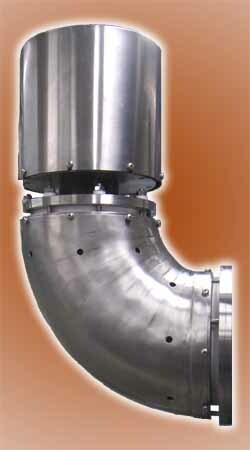 G. Brown, "Wall Sheath and Optimal Bias in Magnetic Filters for Vacuum Arc Plasma Sources", Applied Physics Letters, vol. 80, no. 3. pp. 365 - 367 (2002). X. B. Tian, R. K. Y. Fu, and P. K. Chu, "Effects of Bias Voltage on the Corrosion Resistance of Titanium Nitride Thin Films Fabricated by Dynamic Plasma Immersion Ion Implantation", Journal of Vacuum Science & Technology A, vol. 20, no. 1. pp. 160 - 164 (2002). X. B. Tian, L. P. Wang, R. K. Y. Fu, and P. K. Chu, "Bias Voltage Influence on Surface Morphology of Titanium Nitride Synthesized by Dynamic Nitrogen and Titanium Plasma Immersion Ion Implantation and Deposition", Materials Science & Engineering A, vol. 337, no. 1 - 2, pp. 236 - 240 (2002). T. Zhang, P. K. Chu, R. K. Y. Fu, and I. G. Brown, "Plasma Transport in Magnetic Duct Filter", Journal of Physics D: Applied Physics, vol. 35, no. 24, pp. 3176 - 3180 (2002). M. Zhu, P. Chen, R. K. Y. Fu, W. L. Liu, C. L. Lin, and P. K. Chu, "Formation of Silicon on Plasma Synthesized Aluminum Nitride Novel Structure by Ion Cutting", Journal of Vacuum Science and Technology B, vol. 22. no. 6, pp. 2748 - 2753 (2004). A. P. Huang, R. K. Y. Fu, P. K. Chu, L. Wang, W. Y. Cheung, J. B. Xu, and S. P. Wong, "Plasma Nitridation and Microstructure of high-k ZrO2 Thin Films Fabricated by Cathodic Arc Deposition", Journal of Crystal Growth, vol. 277, no. 1 - 4, pp. 422 - 427 (2005). R. K. Y. Fu, S. C. H. Kwok, P. Chen, P. Yang, R. H. C. Ngai, X. B. Tian, and P. K. Chu, "Surface Modification of Cemented Carbide Using Plasma Nitriding and Metal Ion Implantation", Surface and Coatings Technology, vol. 196, no. 1 - 3, pp. 150 - 154 (2005). R. K. Y. Fu, Y. F. Mei, M. Y. Fu, X. Y. Liu, and P. K. Chu, "Thermal Stability of Metal-Doped Diamond-Like Carbon Fabricated by Dual Plasma Deposition", Diamond and Related Materials, vol. 14, no. 9, pp. 1489 -1493 (2005). T. Qiu, X. L. Wu, R. K. Y. Fu, J. Y. Fan, L. W. Yang, P. K. Chu, and G. G. Siu, "Mo-Containing Diamond-Like Carbon Films with Blue Emission", Journal of Crystal Growth, vol. 281, no. 2 - 4, pp. 538 -542 (2005). A. P. Huang, L. Wang, J. B. Xu, and P. K. Chu, "Plasma Nitridated High-k Polycrystalline Array Induced by Electron Irradiation", Nanotechnology, vol. 17, no. 17, vol. 4379 - 4383 (2006). W. Zhang, Y. H. Zhang, J. H. Ji, J. Zhao, Q. Yan, and P. K. Chu," Antimicrobial Properties of Copper Plasma-Modified Polyethylene", Polymer, vol. 47, no. 21, pp. 7441 - 7445 (2006).